72 Noland Hills Drive in Leicester is the Buff Team’s newest listing. Are you looking for privacy, rental income, and maybe an in-law suite? 72 Noland Hills Drive may be the home for you. Located on 3.94 acres in Leicester this property was built in 1990 and has been meticulously maintained. This one story with finished basement is neat and tidy and waiting for you to come visit. Privacy, is that want you’d like? Located at the end of the Noland Hills community in Leicester you can’t see your neighbors as your are tucked away on almost four acres of land. Rental Income are you looking to subsidize your mortgage payment or maybe make a little extra money, this property has a doublewide on the property that could be rented out. I bet you’re wondering, how is it private if there is also a doublewide on the property. The doublewide is tucked nicely behind the home and has a separate driveway. There is also an additional living area in the basement, with kitchen and living area. 72 Noland Hills Drive is an open and spacious home with 3 bedrooms and 3 full bathrooms. It includes a sizable living room, a beautiful eat-in kitchen with breakfast bar plus an additional dining area and a heated sunroom. There is a attached two car garage along with an additional detached two car garage. This home is a must see! If you must see it, please call us at (828) 771-2310 to arrange a showing or send an email to email to email@jimbuff.com! In the past week we have had sizable price reductions on two of the Buff Team Listings. The two properties we’ve had price reductions on are 2373 Riceville Rd in Asheville, 28805 and 2 Dixie Lane in Candler. 2373 Riceville Rd in Asheville-28805 price has recently been reduced to $339,000! This house is a must see and we’re not saying it has the biggest utility room in Buncombe County, but it’s has a pretty sizable one. However that’s not all 2373 Riceville Rd has, that’s just the tip of the iceberg. This home has three bedrooms and two and half baths. It boasts a lovely kitchen with dual ovens, a skylight and tons of cabinet space for storage. There is a heated sunroom in the back for the entire family to enjoy. This immaculate all brick home in East Asheville has a two car garage, a full unfinished basement and it sits on a .84 acre lot in a convenient Riceville location. 2 Dixie Lane in Candler price has recently been improved to $544,900! This house has plenty of space for you and your family or just you if you just want a lot of space. There is a fenced backyard and a rear deck and patio. But the outside space doesn’t end there there is a large covered front deck and it all sits on 2.04 acres. The outside living area is just the beginning. There is a sizable kitchen and large dining area, that would be perfect for entertaining or a just everyday for the family. Dixie Lane has three bedroom and 3 and a half baths. There is a bonus room and a family room to top it off. Along with all the finished space there is plenty of storage space throughout the home. This lovely family home has a three car garage on the main level with an additional 1 car garage in the basement., there are two heat pumps and a central vacuum system. Come see this great home in a great Monta Vista Location! If you’d like to see either of these homes or any other home listed in the area, email us or give us a call at (828) 771-2310 to schedule a showing! This weeks Buff Team’s featured listing is 24 Country Cove Court in Leicester, NC 28748. 24 Country Cove Court is a must see listing on the Buff Team, it’s currently listed for $359,900 – For most up to date pricing, call (828) 771-2310 or check out the listing on the website. 24 Country Cove Court has four bedrooms! That means there is plenty of room for your family. The master bedroom is located on the main level along with the master bathroom. The additional three bedrooms are located on the second level of the house. In addition to the master suite on the main level of the house on 24 Country Cove Court, there is a living room with a beautiful gas logs fireplace, lovely kitchen with quartz countertops and stainless appliances, eat in area plus a separate dining area. 24 Country Cove Court also has a ton of space in the basement. The basement includes a finished room and bathroom that is not counted in the finished sqft or bathroom count. There is also tons of space that could be easily finished for extra space. Along with two driveways to park your cars in the this home has a 2 car attached garage. There is a large deck on the back perfect for entertaining or enjoying the quiet country evenings with your loved ones. Give us a call at (828) 771-2310 or email us to setup a private tour of this four bedroom 2.5 bath home on 1.55 acre lot in Leicester! Guess what is happening this Sunday, February 4th! 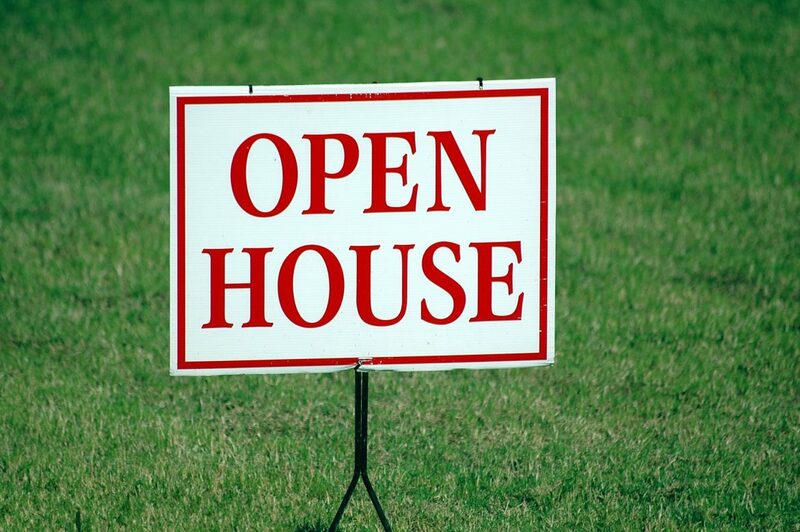 Did you guess Buff Team Open Houses? Probably not, it would be my guess that you said the Super Bowl. Honestly, that would have been my guess too! However, the Buff Team is hosting two open houses this Sunday, February 4th from 1-3pm. You should check them out. One of the open houses will be hosted by Tamra Fore, it will be located at 14 Friendly Way in Asheville, NC 28806. This house has a super convenient location! It is located just minutes away from Erwin Schools. It’s also close to grocery shopping and restaurants. 14 Friendly Way is located within Harmony Subdivision, and it boasts three bedrooms, with the master suite on the main level and two bedrooms on the second level. There is a spacious living room with a fireplace with a rear deck off of living room. There is a lovely den in the basement and tons of unfinished storage as well. The other open house will be hosted by John Zujkowski and it will be held at 2373 Riceville Rd in Asheville NC 28805. This house is located in East Asheville in a super convenient Riceville location. It’s close to both East Asheville and Swannanoa. 2373 Riceville Rd is an immaculate all brick home! It’s a must see. It’s on a level .84 acre lot. IT has a lovely kitchen with dual ovens, skylight and tons of cabinet space. It has a sizable den with a fireplace (gas logs) and a heated sunroom. There is an attached two car garage and a what we think is the largest utility room in Buncombe County! Check out website to see the most up to date pricing! But before the big game go pay Tamra & John a visit at their respective Open Houses. Jim has a new listing in West Asheville, North Carolina, 14 Friendly Way. This property is located in the Harmony subdivision and is just minutes away from schools. It is also convenient to shopping and restaurants as well, with a less than 15 minute drive to downtown Asheville. This property at 14 Friendly Way sits on a .32 acre lot, with a concrete driveway that leads to the two car garage. There is a covered front porch to sit on and enjoy the quiet subdivision. Along with the covered front porch there is a sizeable rear deck off the main living area perfect for entertaining and smaller deck off the family/rec room in the basement. 14 Friendly Way offers a sizable kitchen along with a separate dining room to enjoy your meals in, there is a master bedroom on the main level with an attached bath with two separate sinks and a large master closet. The large living room offers views out the back and a fireplace to keep warm on the cool mountain evenings. Upstairs at 14 Friendly Way, there are two extra bedrooms for guests, children or both. With a full bathroom and an extra little space that would be perfect of a computer area or maybe to store some toys. Lastly in there is a large finished family room in the walk-out basement along with a half bath/laundry room. The basement also has two other rooms that could easily be finished for additional rooms or left as they are now and be used as storage. This house is a must see, it’s close to schools and in a convenient area. It’s offered with a one year American Home Shield Home Warranty. If you would like to see this property or any other listed in the area, give the Buff Team a call at (828) 771-2310! We have a new listing on the Jim Buff Team, 215 Cedar Lane. 215 Cedar Lane is located in Arden, North Carolina and is currently listed for $220,000. This charming home is in a convenient Arden location. Just minutes away from restaurants, shopping, schools & health care. The home at 215 Cedar Lane sits on a nice level .32 lot with a fenced backyard perfect for a small garden, your dog to exercise or just to enjoy the lovely weather in North Carolina. Along with the lovely fenced in backyard there is a tremendous side patio perfect for entertaining or enjoying your morning coffee. Lastly to top it off this home has a covered rocking chair front porch. As far as the inside the home at 215 Cedar Lane has a unique floor plan that includes a sizable living room. The living room has a beautiful rock fireplace perfect to keep you warm and cozy on chilly mountain evenings. There is a dining area with beautiful built-ins. An updated kitchen with a breakfast bar and JENN-AIR cooktop. There are two lovely bedrooms in in 215 Cedar Lane both nicely sized and each have an attached bathroom. One bathroom has a walk-in shower, the other with tub/shower mix. There is a large outbuilding that would be great for storage or a studio. This property also comes with a AHS Home Warranty. If you would like to visit this home, please give us a call at (828) 771-2310 to schedule an appointment. Misconceptions about Selling Real Estate! Many Sellers think that they are the best person to sell their home, and they know exactly what needs to be done to get their home sold. That, is not always a true statement. As a real estate agent we have to be able to show the seller why they need us to represent them then of course we have to perform our duties and get the property sold. We’re going to talk about a few myths of selling your home. All you need to sell your house is the internet. If a homeowner takes some pretty pictures and listing their home as a For Sale By Owner it’s going to sell in days. This is not always true. Yes, many buyers who are actively looking for homes are looking on the internet, but a large majority of the buyers are being represented by a Real Estate Agent. The first place the real estate agent is going to look for properties for their buyers is the MLS and usually it’s not until all possibilities in the MLS have been exhausted that they start looking for For Sale By Owner properties. Property Value. Many times as a seller you may see that a similar house in the neighborhood sold for a certain price and your house may be newer, or better because it’s yours, so obviously you can get more. This could be true but it’s not necessarily what’s going to happen. The price of the home depends on the market, the conditions of the home, improvements that have been made in the home and the actual location within the neighborhood. Pricing…Overpricing. Yes, we know that you want to get the highest possible price for your home, so you plan to price it high so you have plenty of room to negotiate and then the buyer will feel like they are getting a good deal. The truth is, if your price is too high it’s not going to get the buyers in the house because they are not going to be looking at homes that are out of their price range. Also it may make you look unrealistic to others and they won’t want to submit an offer. Paint and Decor. Your favorite color is orange and you like your entire house to be that color. You also love round windows so you replaced all the square windows with round windows. You think everyone will love orange paint and round windows. Probably not so much, many home buyers prefer to stick to more a neutral colors and more conventional shapes and sizes. When they are looking at your orange, round windowed house they may be counting the dollars it takes to fix them, and it could either reduce the amount of their offer or scare them off completely. Clutter, deferred maintenance and staging. You love elephants and you have a large dusty collection that’s in every room, the toilet in the guest bathroom runs if you don’t jiggle the handle and the light switch in the family room doesn’t work, but you’re used to it. People know that you live in your house it’s fine. Well cutting the clutter, fixing the bathroom and doing all the maintenance will save you money and possibly gain you money in the sale of your house. Sometimes when selling a house, less gets you more. Get your return in investment. You paid a certain amount for your home and invested “X” amount over the time you’ve lived in and you are moving and you’re going to get everything you put in the house back, plus maybe a little more, right? Wrong? Unfortunately just because you paid a certain amount for a house doesn’t always mean that’s what it’s going to be what it is worth in today’s market. When you sell your home you will get the Market Value of your home. Sometimes that will bring you more money, sometimes you won’t make your money back. My house doesn’t always have to be available to be shown. If they want to see it the house that bad they are going to come on my schedule. Well, if you’re in a popular area and your house is priced right, yes this could be true, but many times if it’s not available or only has limited times for showing many agents aren’t going to show it. Getting people in the door, gets the house sold. Once we have an offer it’s a done deal. Once we’ve accepted the offer, we’re as good as closed right? No, there are a lot of hurdles to cross before a house officially closes. The buyer has to be approved for their loan, the inspection has to go well and you don’t have a foundation problem that you knew nothing about, the roof doesn’t need to be replaced and oh yeah it appraised for value. Last but not least the buyer didn’t change their mind. Once it’s under contract it doesn’t mean it’s over, it’s not over until the documents are signed and the checks have cleared. Real Estate Agents get paid so much for just looking at homes or just putting a house on the MLS. Yes, that’s all agents do. No, sometimes agents might actually lose money on a sale. Advertising costs money and to get your house sold we have to advertise, you get an hourly wage or set salary for doing your job. We don’t we don’t get paid until the end, so when we are sending emails and talking to you all through the day, that’s just the beginning of the work we as agents do. Before a house is even listed in MLS or we take it to you we’re doing research, looking at comparable properties. Yes, we get paid one lump sum but if you have a good agent they are probably worth every penny and more. So if you’re looking to buy or sell a home, call us at (828) 771-2310. If you’d like to look at some of our current listings click here! Have you been looking for a home for and haven’t found anything that’s exactly what you’re looking for yet, what about building a house? Are you just looking for some land out in the country to have for the future? Are you looking to build some homes and sell them. We can help. If you’re looking for some land to purchase we have several options, and if we don’t have it listed we can help you find it. Here’s what we have available right now! 4.78 acres of land on Cane Creek Rd in Fletcher, NC. This property is in the heart of Cane Creek with over 300ft of road frontage and is NOT in a flood zone. There is a potential for some awesome mountain views with some clearing in the back of the land. This great piece of land is currently listed for $425,000! Lot 2 Destiny Farms Drive in Leicester is 10 acres at the top of the mountain. There are some stunning views from this acreage. This parcel of land has mature trees on it and would offer complete privacy. Plus it already has a building pad ready. This property is currently listed for $85,000! Flynn Branch Rd in Fletcher is 9.54 wonderfully private acres of land. This property is located in Hoopers Creek area. It’s close to both Asheville & Hendersonville but is in a quiet locations. This property offers wooded seclusion with a crystal clear cascading creek . It would be perfect for a gorgeous mini estate or it could be subdivided into smaller lots. The current owner had is surveyed but not recorded This is a great piece of land and the owner will consider a trade. The current price on this beautiful piece of land is $129,500! Lot 19 Hughey Rd in Alexander is a .57 acre lot for sale in the well established Madison View Estates. This lot is wooded and would require well & septic. There are restrictions in this subdivision but off frame modulars are considered. This lot is currently listed for $19,500! 58 Kelly Fields Drive in Alexander is a .61 acres lot for sale in Madison View Estates. This is a beautiful building lot in this community. This lot is cleared, and there are restrictions but off frame modulars are considered. This lot is currently listed for $26,900! 75 Kelly Fields Drive in Alexander is a .57 acre lot for sale in… If you guessed Madison View Estates you would be correct. This lot is also currently listed for $26,900! Next up is 89.86 acres of land on Lotties Creek Rd in Burnsville. If you’re looking for a large tract of land, look no furthers. This property is wonderfully private and has multiple ridges and mountain views. There are 4×4 access roads and homesites throughout. This property would be great for a private estate, hunting cabin or mountain getaway. There is an electric pole and multiple springs on the property. This property is currently listed for $350,000 but give us a call for the most current pricing. Are you looking for a commercial lot? What about a lot on New Leicester Highway in West Asheville. That’s what we have here next this .60 acre lot has tremendous visibility and commercial zoning. The current price on this property is $45,000! Rose Hill Rd is our next property. This 1 acre lot in a convenient south Asheville location. It is beautifully set back for privacy. It’s currently listed for $87,500! Lastly we have lots in West Asheville. We have three, that’s right, three lots for sale in West Asheville on Sand Hill Rd. The three lots range from .17 to .18 acres and they are prime building lots. They are close to Haywood Rd and all the trendy west side has to offer. They are level and cleared, easy to build on lots. Restrictions apply. They are currently listed at $75,000 per lot. If you’d like more information on any of these lots or parcels of land, give us a call at (828) 771-2310. If you’d like more information on any land for sale in the area you can call us about that too.